A former governor's house tastefully renovated into spacious fully equipped apartments. Each is delightfully different and displays a personality of it's own. The Horny Toad Guesthouse offers private and comfortable accommodations within relaxed informal atmosphere at a nominal cost. The superb location was chosen for it's close proximity to the water, the sun, tennis, golf, boating, fishing, and the airport.... plus freeport shopping and casinos. Kitchen facilities were added to give guests the option of dining in to conserve on waistlines and pocketbooks. However, many fabulous restaurants are within a short distance.... on the beach or in the nearby towns of Philipsburg or Marigot. 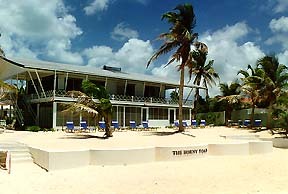 The Horny Toad is a deliberately small and distinctive guesthouse known for its congenial and unpretentious atmosphere. Each spacious housekeeping apartment (there are eight) has a separate bedroom with bath, plus a fully equipped kitchen with living area and private gallery overlooking the secluded beach of Simpson Bay. Fielding's Guide honored the Horny Toad with the Author's Award describing the Horny Toad as "a small and special place" and "one of the best bets on the Island". Fodor's Guide considered it "an excellent value". We're inclined to agree and would love the opportunity to prove it to you. 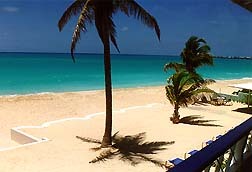 All rates are European Plan, double occupancy. Because some of the apartments are larger than others we give an extra person rate. No children under 7 please. Sorry, no credit cards. Daily maid service except holidays. Government Tax of 8% is added to the daily rate. Check in: 2:00pm    Check out: 12:00 noon. A daily rate will be charged for check out after 12:00 noon. order to confirm. One weeks rate to reserve 3 weeks or more. check-in. Cancellation: 60 days notice.